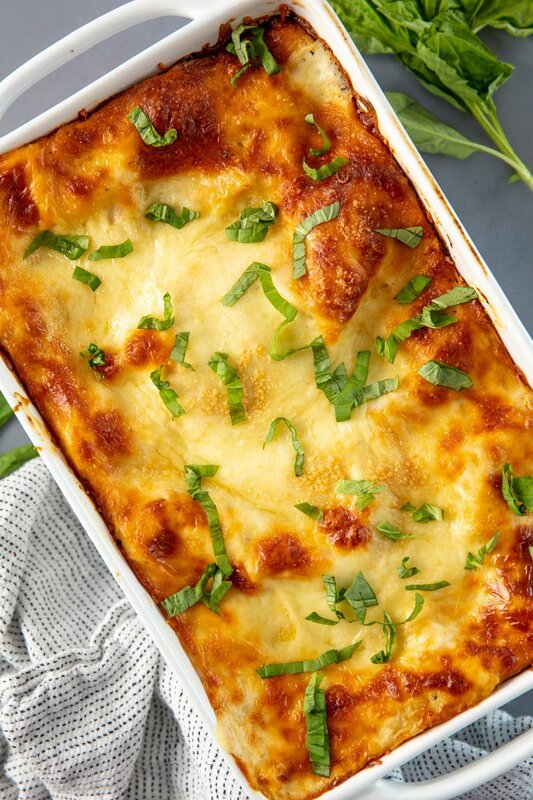 Spinach Artichoke Lasagna takes all the flavors you love from spinach artichoke dip and turns it into an amazingly delicious lasagna. The balance between layers of bechamel, noodles, and the spinach artichoke mixture is perfection! This is an incredibly easy recipes to make! I’ve taken my recipe for spinach artichoke dip and combined it with my recipe for the most amazing lasagna. The result is a fantastic, indulgent lasagna that people will rave over! This lasagna recipe has three main components: the pasta, a spinach artichoke ricotta filling, and a simple bechamel sauce. You’ll also need some mozzarella and parmesan cheese for assembly. I’ve given you the best hack ever for your lasagna noodles and included it as part of the recipe. 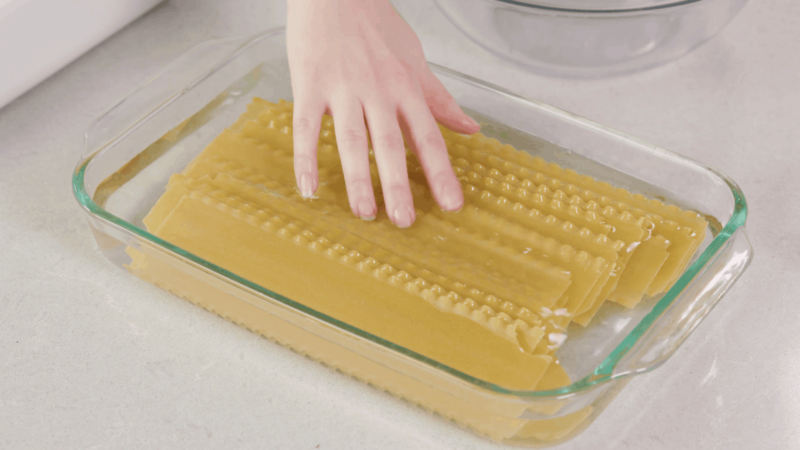 No boil lasagna noodles work, but they often end up a bit of an odd texture and absorb too much liquid in the recipe. Instead, I use regular lasagna noodles and STILL don’t boil them. All you have to do is place them into a container and pour hot water over them. Let them soak for 30 minutes and they’ll be tender enough to use in the recipe. Don’t worry, they will finish cooking in the oven. This allows you to get the rest of your ingredients ready to assemble your lasagna, without having to pay attention to it. PRO TIP: Move them around after the first 5 minutes to help prevent the pasta sheets from sticking to each other. A simple swish and swirl in the pan should do it. SPINACH NOTE: This recipe calls for frozen chopped spinach that has been thawed and drained. You can cook this in the microwave in a matter of minutes, but the spinach needs to be drained well. You don’t want a lot of extra water in this recipe so squeeze out as much of the water as you can. ARTICHOKE NOTE: You can use either marinated artichoke hearts or artichoke harts that have been canned in water for this recipe. 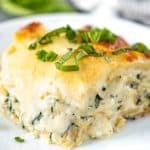 Spinach Artichoke Lasagna takes all the flavors you love from spinach artichoke dip and turns it into an amazingly delicious lasagna. The balance between layers of cheese, noodles, and the spinach artichoke mixture is perfection! Place lasagna pasta sheets into the bottom of a pan. Pour hot tap water directly over the noodles, making sure the pasta is completely immersed in the water. Let them soak for 30 minutes, then drain and discard water. For the spinach artichoke filling: In a mixing bowl, mix together cream cheese, ricotta, mayonnaise, Parmesan cheese, garlic, basil, salt, and pepper. Gently stir in artichoke hearts and spinach. Set aside. For the bechamel: melt butter in a medium sized saucepan over medium high heat. Whisk in flour and cook 2 minutes to brown. Slowly whisk in milk. Season with salt and pepper to taste. To assemble, spread about 1 cup of bechamel in the bottom of the prepared pan. Place 4 noodles on top to cover. Spread with 1/3 of the spinach artichoke mixture. Top with 1/2 of mozzarella cheese. Spoon 1 1/2 cups bechamel over mozzarella, then sprinkle with 1/4 cup parmesan cheese. Repeat layering two more times to create three complete layers. To finish, place a final layer of pasta, topped with another 1 cup of bechamel to cover the pasta. Top with remaining mozzarella and Parmesan cheese. Cover loosely with aluminum foil. We made this for a few friends. They loved it. My wife did not change the recipe but for the next time we decided to add a sprinkle of lemon juice to the spinach and something to make it a little more spicy. Great vegetarian dish. . Genius on the lasagne noodles. Can’t wait to try this.